Yesterday’s news that Bradley Cooper (Silver Linings Playbook) would be departing Gavin O’Connor’s Jane Got a Gun makes a little more sense in light of today’s news: Cooper will star in American Sniper for director Steven Spielberg. The Oscar-nominated actor has been involved with the picture – an adaptation of the bestselling Navy SEAL autobiography – for at least a year now. It was previously thought that Cooper would re-team with director David O. Russell for the picture, but with those two currently filming American Hustle, it looks like Spielberg has signed on for American Sniper. 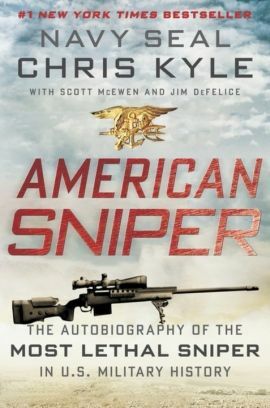 The autobiography from Texan Navy SEAL Chris Kyle retells his exploits of recording the highest number of sniper kills for an American, earning himself the nickname al-Shaitan (“the devil”) from Iraqi insurgents. Passages from Kyle’s wife, “who slowly watches as her husband’s affection turns from her to the SEALs and war,” form an emotional core. Hit the jump for more. The Wrap reports that Spielberg will make American Sniper his next directorial effort. Spielberg was expected to helm the Robopocalypse adaptation, but that film was delayed earlier this year. He’s also busy co-producing a third wartime miniseries for HBO, will be jury president at the upcoming Cannes Film Festival, is developing Stanley Kubrick’s Napoleon as a TV miniseries, and has a number of other films in mind over the next few years – though Gods and Kings won’t be one of them.